The prediction of sand production is a critical step in the sand face completion design process. It allows an understanding of the potential for wellbore failure under the expected production/injection conditions for the well. It is vital to understand the impact of sand production on your production targets in order to properly select your sand control options. Innovative Engineering utilizes in-house developed engineering systems based on a modified pseudo 3D model (Kessler, 1993) to determine the critical drawdown pressures (CDP) for the reservoir. 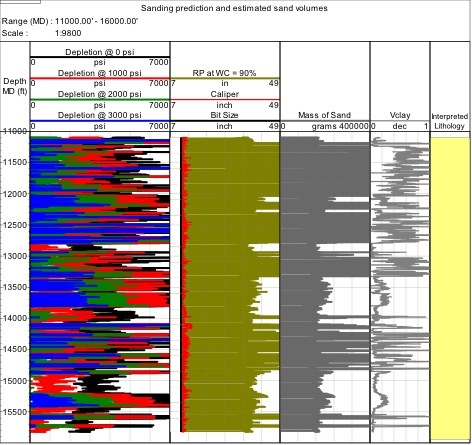 Sand production predictions are presented for openhole and cased/perforated well configurations. Sensitivity studies to pressure depletion, well paths, and stress orientation can also be conducted. 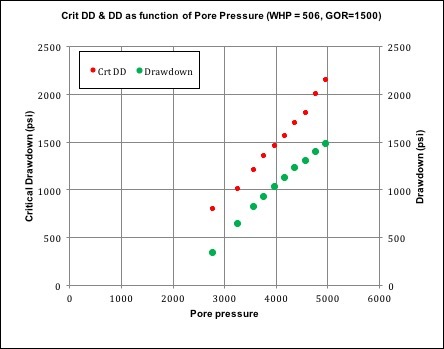 Determination of optimum pressure drawdown conditions throughout the life cycle of a well/field. Determine sand free production rates and sand management issues. Select the optimum production bore size, well path, deviation and orientation. Estimate erosion rates and sand production volumes for development of a field environmentally compliant and safe production strategy.